In Residence: Most Rev. Joseph E. Kurtz, D.D. Open Sundays, 10:30 a.m.-2 p.m.
Sundays — Sat evening: 5:30 p.m.; Sun: 9:30 a.m., 12 noon, 5:30 p.m.
Holy Days — Contact the parish office for times. Catholics were a small and scattered lot in the earliest days after Louisville’s founding in 1778. There were apparently a few occasional Masses celebrated, such as during the visit of the young Father Benedict Joseph Flaget in 1792 during his journey to Vincennes. This would likely have taken place in a home near today’s Fifth and Main Streets. The roots of the first real Catholic congregation can be traced to about 1805 when the small Catholic community of Louisville was served by regular priestly visits from Father Stephen Badin, the first Catholic priest ordained in the United States. Badin and other clerics came up from “the Kentucky Holy Land” to minister to that primal congregation that was to become the Cathedral of the Assumption Parish. The congregation got its first building in 1811 on Tenth Street, between Main Street and the Ohio River. The name St. Louis was adopted for the parish, commemorating the saintly King Louis IX of France. But presumably the name of Louis was also a reference to Louisville’s own naming in honor of France’s Louis XVI, for the aid he rendered to the American Revolution. The first permanent pastor of St. Louis Parish was a young Belgian priest, Father Philip Hosten. He died in the autumn of 1821 from a pestilent fever he caught while ministering to the sick. The parish began construction of a new church on Fifth Street (the current Cathedral site) in 1830, and an impressive dedication was held the following year. During the antebellum years, Mother Catherine Spalding was a leading force, having organized a school in 1831 that today, as Presentation Academy, is the oldest school in continuous operation in Louisville. She also established the institution that came to be known as St. Thomas-St. Vincent Orphanage. Several of the pastors of the church in that era, such as Fathers John McGill and Ignatius Reynolds, were destined to become bishops in other parts of the United States. When the seat of the Bardstown diocese was transferred to Louisville in 1841, St. Louis became the new cathedral, and Bishop Benedict Joseph Flaget took up his residence next door. Perhaps his last public act was his blessing of the cornerstone for a new structure, today’s Cathedral of the Assumption, on August 15, 1849. Because that was the Feast of the Blessed Virgin’s Assumption, that name was affixed to the parish that had been known under the patronage of Saint Louis. The old bishop died at his residence on Fifth Street on February 11, 1850, and is now buried in the undercroft in the Chapel of the Bishops. The new American Gothic structure, designed by William Keely, was dedicated October 3, 1852, with eight bishops and the first American cardinal present. The Cathedral parish immediately began to function. It established the St. Vincent de Paul Society for relief of the poor in 1853, a sodality, and a literary association for the Cathedral’s young men. In the 1890s, the Cathedral was the venue not only for liturgical choirs, but also for full orchestral presentations, soloists, and slide shows. The establishment of a kindergarten and a night school for “bootblacks” and other working children reflected its social outreach. Classes in Christian doctrine as well as secular subjects were held in the Cathedral basement. In 1912 the Cathedral was renovated and its lighting updated. The most notable change was the installation of sixteen stained-glass windows to replace the plainer originals of 1852. A renowned pastor at the start of the twentieth century was the linguist and inventor Father Michael Bouchet. On December 11, 1937, Louisville was elevated to a Metropolitan See with the status of an Archdiocese, as thirty-two of its counties were placed under the jurisdiction of Owensboro. The first archbishop, John A. Floersh, led Louisville Catholics for forty-four years. The 1930s brought severe economic depression, the 1937 flood, and stern rumblings of the Second World War. The Cathedral’s iron fences were donated to the government scrap metal drive. As the downtown area grew more and more deserted by the 1940s, the Cathedral became a streetcar parish and a popular place for confession. With the creation of suburban parishes, the city center parish diminished in vitality. By 1956, the Cathedral parish school closed. Yet, at the assassination of President John F. Kennedy in 1963, the Cathedral bell, long silent, tolled a summons that drew an overflowing crowd. Strong Catholic voices rang out against the Vietnam War in the early 1970s, and Archbishop Thomas J. McDonough issued a statement against abortion, newly legalized in 1973. In 1972 the Cathedral was sealed for major renovation, even as the city underwent major reconstruction that offered a promise of a second spring for the Cathedral. In the mid-1980s, the number of Cathedral families grew from a low point of 266 to 1,600 by the 1990s. Outreach to street people and sponsorship of shelters were accompanied by dynamic preaching and vital liturgies. A new, creative entity, the Cathedral Heritage Foundation (now the Center for Interfaith Relations) was established to undertake fundraising for the Cathedral’s restoration. They have also supported Cathedral arts and music. The newly restored Mother Church of the Archdiocese was unveiled and rededicated in November 1994. The Cathedral intensified its role as a sacred place for selected community events, its choir even traveling abroad. But at heart, the Cathedral of the Assumption retains its identity as a vital, truly Catholic community of faith; its daily life one of faith, hope, charity and justice. It reaches out ecumenically to congregations of other Christians and in some ways surpasses the initial strength of the 1890s. The Cathedral of the Assumption has marched into the third millennium with renewed hope and promise. The Cathedral has a rich ecumenical history from its beginning, when substantial funds were contributed by Protestant denominations for the construction of the original church. The mission of the Center for Interfaith Relations (formerly the Cathedral Heritage Foundation) is to promote and effect interreligious understanding, cooperation, and action. To this end the Center hosts an annual Festival of Faiths, a celebration of the many different faith traditions in our area, as well as many other programs and activities. Parish membership now numbers more than 2,500. The parish has a history of strong lay leadership and community activism, with more than forty areas of service and ministry to parishioners and the community. 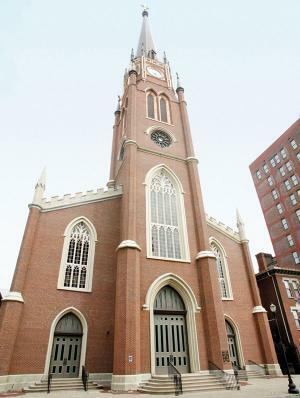 In 2006, the Archdiocese of Louisville History Center opened in the Patterson Education Center, 424 South Fifth Street, across from the Cathedral.